My bright and beautiful, quirky and kind son wrote this essay for a contest sponsored by the San Diego Public Library. He won! The topic of his essay ~ If all the books in the world were about to disappear, which book would you save and why? Frindle is a book about a fifth grader named Nicholas Allen who creates a new word, and the word spreads across the country. If all the books in the world were about to disappear I would choose this one because it’s about creativity, it teaches you how to make new words, plus it’s super funny. Frindle is a book about creativity, and if you put something out there, you never know what to expect. Really, this book makes you realize one change can go a long way. Nicholas Allen learns from his teacher how words are created, how they are used, and how they aren’t used. The book teaches you how words are created, and what words have to do to be a real word. For example, it has to be written, spoken, and finally, put in the dictionary. Frindle is a funny book with an interesting story about comedy and creativity and laughing at every page. The story is so funny I laughed myself to sleep. For example: “Mrs. Granger was one of those people who never sweats. It have to be over 90 degrees before she even took off her jacket.” This is one part of the book that is really funny. In conclusion, Frindle is about creativity, how words are created, and a pinch of hyperbole. All these reasons are why I chose Frindle to be the book I would save if all of the books were about to disappear. I hope you have a great time reading Frindle. Thanks, Mateo and Ali B! It's a good essay and a lot of guys like Frindle. How about YOU? What book would YOU save if all the books in the world were about to disappear? This applies to all you reader guys and all you grownup followers of this blog. Hit that "Comment" button below this post and let us know! The King's Ransom, Big Johnson Bone, Alvin Ho and Other Books to Get Excited About! Yes, yes, yes, guys, this is one exciting month! Not only have I read three terrific new books, but two my most eagerly-anticipated books of the year have come in. 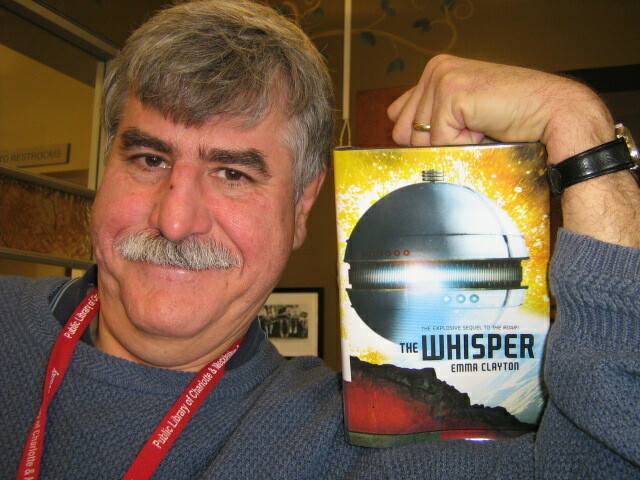 I'm talking, of course, about The Secret of Ashona by Kaza Kingsley and The Whisper by Emma Clayton. What??? Did you say you don't know about them?? Well , let the Iron Guy educate you! The first one is the latest book in the fan-tastic Erec Rex series and the second is the sequel to The Roar, which was one of the most thrilling sci-fi books I've ever read. You can see my review here and you'll also see that it got 7 comments, the most for any book ever reviewed on this blog. 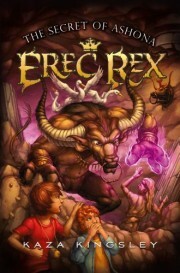 You can also click on the "Erec Rex" label under this post to see what I've written about those books and why I like them so much. This book has the thrills, spills, and action that you always find in this series but there is also a BIG surprise at the end that will hit you like an A-bomb! This is one fun read! It's a graphic novel based on the Bone characters and it's seet in a time before the Bone series takes place. Big Johnson Bone is a frontier explorer in the Davy Crockett tradition. In other words, he's tough enough to ride tornadoes and ain't afraid of nuthin'! So when a tornado really does pick him up, he lands in a new valley. It turns out, however, that the woodland creatures in the valley are terrorized by the rat creatures. Well, who else would rescue them but Big Johnson Bone! So he strides up to the cave of the Rat Creature Queen--and gets swallowed by the Queen's giant son!! Can he survive? Well, getting eaten by giant ugly creatures is just a minor inconvenience for Big Johnson Bone! This is a rip-roaring good yarn. Included in this book is "Riblet", another story by Tom Sniegoski with artwork by Stan Sakai. In this one, the cute woodland animal creatures are playing until Riblet, the little pig, gets captured by the rat creatures. Isn't that terrible? Yes, it is--for the rat creatures! You'll laugh our loud at this one. I sure did! PS: The illustrations in this book are in black and white, like the original Bone series. If you'd like to see them (and others) in color, be sure to check out Bone: Tall Tales by Jeff Smith and Tom Sniegoski. Alvin Ho, the second-grader who's afraid of everything, has to go to a funeral! Yipes! Alvin's grandfather's best friend died unexpectedly. His grandfather is very sad, of course, and Alvin tries to make him feel better by agreeing to go to the funeral. Everyone is very proud of Alvin but then the boy realizes something terrible--he's actually going to have to do it! Can he overcome his fears? For his grandfather's sake? This book is every bit as good as the other three Alvin Ho books (and that's saying a lot!) but in a different, more subdued kind of way. It isn't as bust-your-gut, laugh-out-loud funny as the others, except for one part I'll tell you about in a minute, but it will make you smile a lot and give some good insights into growing up. I liked it a lot and recommend it highly to all reader guys. And there is one part that did make me laugh uproariously. Alvin is too afraid to talk in school, so when his grandfather's friend dies, some kids think it's actually Alvin's grandfather! Will he ever tell what really happened? And if not...well, you got to read it to find out! It will make you laugh!! Besides, how could you resist a book in which the dad curses in mock-Shakespearean language? Listen to what he says while trying to fix the car: "Thou goatish crook-pated canker ratsbane...Thine horrid image doth unfix my hair." That's right--I told you that you'd laugh! PS--the photos of the new Erec Rex book and The Whisper didn't turn out well, so I'm putting better pictures down here. Either the flash reflected off the covers or it was the glow of manliness that radiates from the Iron Guy. All right, men, go find these books! And let us know what you think of them. 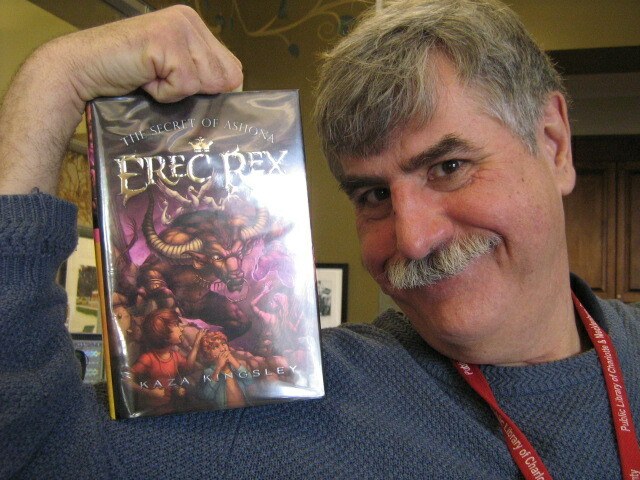 Here are a couple of random thoughts from the Iron Guy and two notices about great reads. This week marks the passing of a truly terrific author, John Christopher. His most famous books are the Tripods trilogy, three very remarkable books that deal with a takeover of Earth by aliens and the attempts of young Will Parker and friends to overthrow them. Sound like a familiar story? Well, you've never read it like this! There's plenty of excitement and you won't forget the scenes of Will hiding in the stream while the Tripods look for him or of his life as a slave in the alien city. Check out my reviews of the books here, here and here. Do not waste any time!! Go out! Read them! Now! 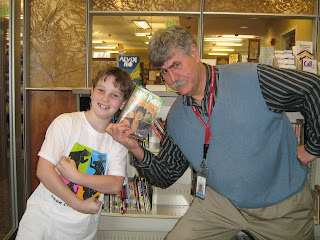 The Iron Guy has almost completed his epic task of finishing Harry Potter and the Goblet of Fire. It was indeed a struggle for a while, especially trying to plow through those middle chapters and realizing with weariness that there was 100 pages between the second and third tasks, but the Iron Guy MANFULLY persevered and has almost completed the last chapter, laughing to scorn all those who doubted him. Actually, it got a lot easier as the story got closer to that third task. In fact, I spent two-and-a-half hours on my day off glued to the story and turning pages as quickly as I could. J. K. Rowling is one powerful writer and knows how to hook you! But it may be a long time before I pick up another Harry Potter book. I'll tell you why when I have time for a longer post. Coke and Pep McDonald are back in Dan Gutman's newest novel! Previously in The Genius Files, Coke and Pep found out that they are part of a super-secret organization called The Genius Files. Hundreds of kids around the world have been singled out as geniuses, and so have this brother and sister. Their parents must never know. In the last book, the McDonald's set out on a cross-country road trip to Washington, D.C. to attend Aunt Judy's wedding. On the way, they stopped at wierd but real places like the Pez dispenser museum, the SPAM museum, and other oddities. Along the way, their health teacher, two guys in bowler hats, and even the creator of the Genius Files tried to kill them. They narrowly escaped each time, knowing that they'd get a million dollars when they turned 21. Now, as their road trip continues, the health teacher and bowler hat dudes continue to chase them. They're especially mad that the twins killed the creator of the Genius Files, Dr. Warsaw. But coke and Pep have a new enemy: Archie Clone, another kid in the Genius Files. He's trying to kill them because he found out that the million dollars will be split between every genius kid... unless he kills them all. In this new book, the twins will be held up with a chocolate gun, frozen in ice cream, lowered into boiling oil, and dropped out of a helicopter. Will they survive? Find out for yourself in the best book Dan Gutman has ever written! Also check out book 1: Mission Unstoppable. Don't forget--any guy who writes a review for the first time can come to the Myers Park library and choose a free book from our ultra-cool prize box! Eleanor Estes is the best author everrrrrrrr!!! She wrote the book Hundred dresses. Its about Wanda a girl who makes hundred dresses. Wanda always gets teased at school. Read and see what happens next. I like this book because it’s a little touching if you like touching books you will enjoy reading it .P.S it won a Newberry Honor medal. Faolan is a little maldcah wolf pup. In Wolf langauge maldcah means "cursed one" but faolan is forced by thunderheart to used his twisted paw for better. The spiral on his paw leads him to a cave faolan later reffers to as "the cave through time" What do the ancient paintings mean? Where will they lead Faolan? Can Foalan figure it out before all goes wrong? Read about it in book #1 LONE WOLF. I love this book because of the fast action & fantasy relating to reality. It is a great book for children ages 10+. It is teaching a very valuable lesson and something you need to learn: Just because you may be different all are equal. Never give up hope. Beleive. My favorite series is the Percy Jackson series. 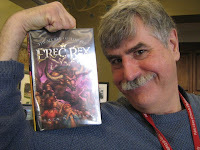 The author is Rick Riordan. I just started the book and it is great. The plot and setting is interesting. I’ve already seen the movie but I think the book is way better than the movie. It’s about a boy named Percy Jackson and the gods think he stole the lightning bolt from his uncle, Zeus. He has to give it back to him by a specific time. Can he make it? I liked this book. I loved the book it is about a boy that goes into middle school and says it is horrible and his friend embarrasses him he gets in a lot of trouble with his brothers. I really liked this book because it is very funny. The Mysterious Benedict Society is a book by Trenton Lee Stewert and is the best book ever because there is just 4 kids in the whole world who can stop the evil Lathrode Curtain from controlling the world these kids are Reynie , Sticky , Kate and the stubborn Constance. With the help of Milligan, Mr. Benidict, Rhonda, and Number .Two the kids must go to a mysterious school on a mysterious island. This book is about a girl who gets caught by a giant the BFG ( the big friendly giant) . That girl figures out that 8 other giants travel at night and gobble up humans like they are a snack of popcorn. In this book they are words that the BFG says that make no sense because the BFG never went to school. I really like this book because it is really funny. It also not the closest to be true. I don’t really like this book because it is really slow at the beginning. But that doesn’t mean you shouldn’t read it. For the Son of Neptune I liked it because it has a lot of action and suspense. There you go! Good reads recommended by actual readers guys (and girls too) just like you! Have YOU read anything that you're dying to tell us about? Hit that "comment" tab and write your own review. The Iron Guy loves to pass on the news about great reads!